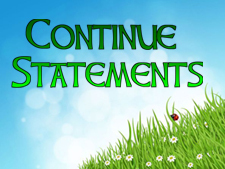 What is Continue statement in C#? What is the benefit of using continue statement in C# programming? How to use Continue statement in program? The continue statements enable you to skip the loop and jump the loop to next iteration. In this program, skips the loop until the current value of i reaches 6. Output is given below. In this chapter you learned about continue statement in C#. In next chapter you will learn return statement in C#.